According to 3PlayMedia, 60% of those who have hearing loss are either in the workforce or in an educational setting. 20% of Americans are deaf or hard of hearing. That's 48 million Americans. The good news is that, technology, when correctly used, helps overcome barriers in the workplace. The principal barrier to communication accessibility to people who are deaf or hard of hearing is that most stakeholders don't even know they're stakeholders. Their lack of knowledge can be a barrier to communication accessibility and a violation of civil rights under the Americans with Disabilities Act. How many readers here are aware that many people with hearing loss don't know or use sign language? They use captioning, sometimes referred to as CART Captioning or CART, which stands for Communication Access Realtime Translation. When it comes to including people with hearing loss in company events, stakeholders' knowledge, gained through articles such as these and through proper training, removes barriers. Technology is awesome when we know how to unleash its power. Giving stakeholders presentation skills training along with training in the proper technology and in the correct use of technology will build the bridge to communication accessibility. Everyone knows someone with hearing loss. How do we include them in events at work? Here is a little information to get started on the communication accessibility journey. In an earlier article, I described the different deaf populations. The deaf or hard of hearing population I serve may never have spoken a word of ASL (American Sign Language) because they grew up in or live in a hearing environment. Some lost hearing later in life. They use captioning for accessibility in meetings, teleconferences, and large events such as in-person and online conferences or town halls. An administrator or manager who does not have experience with people with hearing loss, and who does not consult someone such as an expert captioner, can make incorrect assumptions and unfortunate decisions about accessibility and thus not meet the needs of people who need accessibility via captioning. One common example is assuming a sign language interpreter is sufficient for all deaf people. Just as providing a Greek interpreter for someone who does not speak Greek is counterproductive and a waste of time and money, a sign language interpreter is not the answer to communication accessibility to people who use captioning. We cannot see what another person is hearing. That is why the disability of hearing loss of non-signing deaf and hard of hearing people—people who communicate through spoken language—has been called "the invisible condition." At different times in my career as a nationally certified realtime captioner to people with hearing loss, various professionals, including professors, doctors, supervisors, and other people who communicate important information have said to me, "They hear me fine," referring to the person with hearing loss. This comment is a barrier to accessibility because it does not consider other circumstances and the authentic needs of the person with hearing loss. If a person who is deaf or hard of hearing communicates fluidly—hears, understands, and responds accurately—with one other person in a quiet setting, it is easy to assume they can function just as well in other settings. When more space, distance, sounds, and people are added, communication access is needed via captioning. This simple fact can be confusing to people who are hearing, and this confusion leads to inferior or no accessibility. Then there is the group of people who deny their hearing loss and may be afraid of being found out as being different or even fear being fired because they may be viewed as old. Most of the population I serve are between 18 and 55 years old, so hearing loss can and does happen at any age. Allies in the workplace can help to overcome the challenges of gradual or sudden hearing loss. Grassroots support and a bottom-up approach is a way to bring technology and accessibility into a meaningful and lasting handshake. Let's consider the little magic box which many of us love: the cell phone. The cell phone can provide a simple, subtle technological solution in many situations. Stakeholder training of how to create the right environment for the magic box to deliver its magic is crucial to its success. Once people onsite are knowledgeable-and they put into place what is needed-the user of captioning can view real time captions on their cell phone and participate in the conversation, the online meeting, in-person conference, town hall, or scrum. The CEO—Taking a top-down approach is usually the most successful. Once the boss okays it, the staff can go ahead with training and implementation. The Event Planner—Much confusion, and poor or no captioning, results when an event planner has had no training in who captioners are, what they do, and what prep materials and onsite requirements are needed to provide accessibility. Speakers—Most speakers or presenters may be experts in their chosen field and yet have never been trained how to communicate in public, and more specifically, how to communicate in the presence of hearing loss. Let's face it; it is scary for many of us to speak in public. AV technicians, the IT staff, managers, and co-workers—Don't let the captions stink! Communication accessibility begins with communication within the community. I hope curiosity is piqued. With the proper training and technology, differences can be made within a company. One can become an ally to a colleague or co-worker, the boss, or staff member to establish communication accessibility as a given in all communication situations and bring the company closer to achieving 100% inclusion. Hints on Teleconference Communication: Use a headset—not a speakerphone—for teleconferences. Especially in a conference room where several people are gathered, everyone should have their own headset. Yes, we can hear an echo, side conversations, a dog barking, a baby crying, a chair squeaking, coffee cup clacking, ice cubes clinking in a glass, and what we hope is water being poured . . . oh, and, please mute microphones when they're not being used. 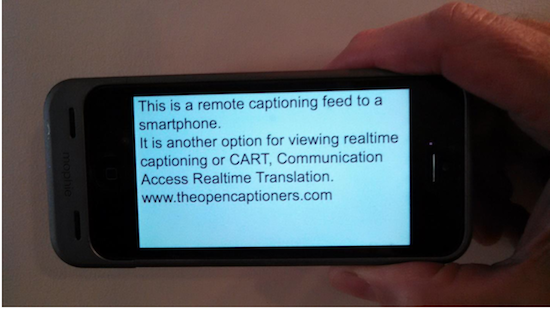 Randi C. Friedman has been providing Open Captioning and communication access realtime translation (CART) for 18 years. She has captioned United States presidents, Bon Jovi, and ordinary people. She is a computer conference and STEM captioning specialist and also enjoys providing personal captioning for 100th birthday parties and weddings for people with hearing loss. Based on 18 years of experience as a captioner and her observation of the barriers to communication accessibility, Randi teaches Microphone Awareness and Presentation Skills—MAPS© training—and Removing Unconscious Barriers—RUB© sensitivity training. As Randi sees it, "An evolved society seeks to include all its members. Inclusion benefits everyone."